Here's Number 10, Number 9, Number 8, and Number 7. 6. The non-question of J'onn's costume. 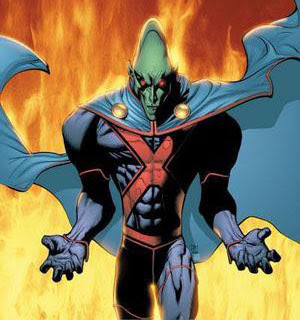 Trying to decide what the Modern, post-Blackest Night Martian Manhunter will look like will be easy. The question of "what should he look like?" shouldn't even enter your minds. Just go back to what works. For the costume: navy blue cape, red cross-straps, blue boots, gold medallions, popped collar or folded collar (artist's choice), and the "pie" belt buckle. As for our Martian friend himself, he's got a superhero physique, a prominent brow, and green skin. He looks different enough to be recognized as an alien, but not too far removed from a humanoid form to be relatable. Edited to add: I'm not hard-set on the costume's color scheme per se, and as long as there are no bodysuits involved, I'll probably be happy. But I am dead-set on how J'onn himself looks. Keep the beetle brow, of course, but by all means, get rid of the conehead. And when going icognito in his secret identity of John Jones? Then J'onn wears a suit, a trenchcoat (with popped collar--isn't he stylish? ), and like all proper noir detectives, a Fedora. Let's not forget the tie. Jaunting about town? J'onn still wears a suit, sans overcoat. It doesn't matter what color, really. Usually it's blue, but I've seen him take a chance and wear the occasional burgundy suit. As you can see, he rotates his ties in addition to his suits. And the pocket hanky? A must. 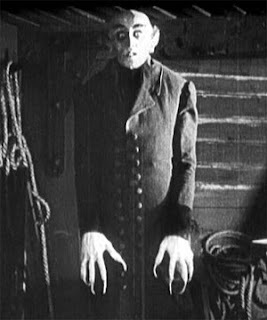 Is he supposed to be Nosferatu?! What IS this? What is this saying to the reader? I believe in intuitive character design: at first glance, you should get a pretty good handle on what a character is all about. Is he good or bad? Can you tell by looking at him?! Why is he so angry? What's with the grabbing hands? The dark bodysuit? Is he an assassin? What's with the conehead? Does he use it for sonar reception? 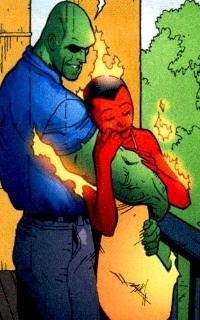 I know J'onn was off "finding himself" during this period and wanted to stop compromising his appearance based on satisfying the public conception of what a Martian looks like. But J'onn never harbored dislike for humanity--he was distant, yes, but never unapproachable, and his looks reflected that. 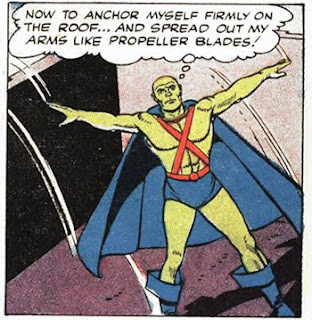 Changing his look to the alien conehead look throws out the unapproachable bit right out the window and gives our hero an air of "I don't care what you think about me," and I don't think that's who J'onn is deep down. The conehead looks just looks sinister to me, and if there's a shapeshifting telepath from Mars running around, the last thing I'd want is for him to look unfriendly. 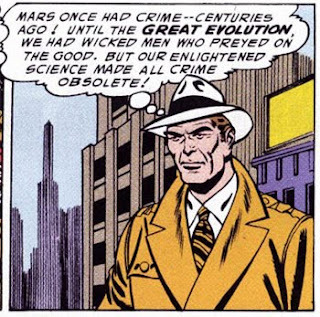 Not to mention that it also throws the sanctity of the true Martian form right out the window--something that used to be private, even back on Mars. I found your reference photo! Don't ask. You don't want to know. Trust me. Why is all this important? Clothes make the man...or Martian. J'onn is a classy kind of character, he's formal and probably a traditional kind of guy. So he should dress that way: a nice sharp suit (not striped), with a Fedora to clue the reader in to his being a detective. Just like I think all comic book journalists should wear press passes in their hatbands, all detectives should wear Fedoras. In short: to return J'onn to his classic roots, return him to his classic duds. Classic superhero costume, and a sensible suit (with hat) while in human form. Also, I like the polo shirt and slacks. 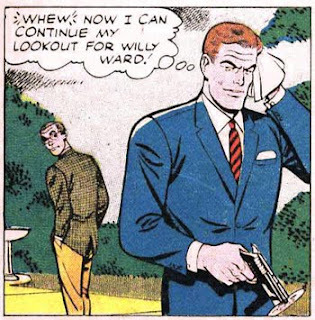 It's how you'd expect an off-duty '50s cop to dress, and is formal enough to pass muster. I also dig the cognitive dissonance of his dressing so upscale normal while clearly being anything but. The demonic trailer trash can go, though. I'm something of a Joe Kelley apologist, and have a soft spot for Scorch (likely because I'm blissfully unaware of her Joker/Mxy/I'mnotsure laden origins), and I feel no one need apologize for Doug Mahnke, so the images you used were actually among my favorite modern ones. The only thing that bothered me about the domestic bliss scene was that he was grilling burgers, when Giffen/Dematteis made him vegetarian back in the JLI days. Which wouldn't be that big a deal except I feel vegetarianism fits with his being an alien/respect for life/sensitivity to sentience in other lifeforms. After all, if you could read the cows mind, how appetizing could it be? (Full disclosure; I am a vegetarian, so I'm a little biased, but I stand by my arguments on their merits). And as for the bizness casual, I'm with Frank. Plus, Mahnke. And the other Mahnke image, from FC: Requiem, while I know what you're saying, Mahnke makes everthing better. I like how he took the "more alien" angle and ran with it. I'd go so far as to support the idea that he made the change not to be more "true" to his origins, but more to express his alienness and to put the scare into evil doers. I thought this was rather effective on the Justice League: Crisis on Two Earths DVD. In summation, I think the newer costumes have merit and drawbacks, and I'm not wholly opposed. I still like the modern classic look best; Folded collar, gold clasps...them's the stuffs. "what good is green skin if you can't show it off?" That's my main point of contention against the new look: it covers up the green skin, hence, his Martianness. While I always thought his traditional costume was a bit ridiculous (I mean, you know how I hate clashing colors), I'm feeling nostalgic for it. I wouldn't mind a redesign as long as it was completely radical, like the OYL one. "Also, I like the polo shirt and slacks. It's how you'd expect an off-duty '50s cop to dress, and is formal enough to pass muster." Meh. Okay. Maybe once in a while. But I like the formality of the Silver Age attire, and I want a strong Silver Age influence in the reboot. "was that he was grilling burgers, when Giffen/Dematteis made him vegetarian back in the JLI days." Yes, and yes. 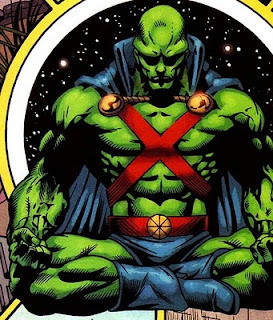 Mahnke is great and I love him, and I applaud the whole not-doing-things-halfway part of the redesign...but I think it completely changes the fundamental identity of who J'onn is. "but more to express his alienness and to put the scare into evil doers" I don't think he should be the scary guy. That's Batman's job. He embraced Earth as his adopted homeworld, so why the sudden change to turn his back on us? It just feels so artificial to me, and something forced upon the character by editors. It wasn't an organic change. Liss, does anyone like the conehead? I've yet to meet that person. Totally "what were they thinking?" You know what I hate? The red. No red straps. No red eyes. Period. As with the conehead, it's an aggressive aspect of an otherwise cool, reserved figure. M.C., you're on your own in defending Joe Kelly. His JLA officially jumped the shark on the Morrison relaunch. Scorch is okay, but as a love interest, not so much. Doug Mahnke is one of the great MM artists. He just can't draw the Ladronne OYL suit much better than anyone else, and the cover Liss used was a really terrible swan song image for the character. Like Howard Porter, Mahnke ran with the creative license extended by the Martian Manhunter, and it allowed J'Onn to look better than most of the rest of the team under their pencils. Can't you grill soy burgers? I'm totally on board with the vegetarianism. If he wouldn't kill Despero when he had the chance, how can he devour mammals? Exploit them for milk and cookies, but not outright devour. To state my costume preferences: folded collar, white pie belt, optional clasps, NO bracelets, NO tiaras, NO gloves and billowing cavalier boots ala Adam Hughes. Everything in the middle is up for grabs. Frank, did you get a chance to see the Crisis on Two Earths DVD? As much as I hate the conehead, like m.c. said, it does kinda work in the movie. They've modified it quite a bit. I still don't really like it, but it's nice to see the Timmverse version of OYL. The red...well, you know I don't like the red on green...I actually don't like red or green at all. Green's just a tough color to complement, I think. If it's not white, black, or tone-on-tone, I don't think it really goes with green. As for the eyes, maybe black eyes with white pupils, as has been done in the past on occasion? If you take out red, though, people will cry foul because Mars is the Red Planet....but so what? I don't always have to wear blue and green becuase I'm from Earth, do I? Mahnke is wonderful--and he's only getting better. Looking back at JLA you can see a nice progression compared with the recent GL stuff. "Can't you grill soy burgers?" Good one. Hey, it just hit me. You know what complements green really well? Purple. I own New Frontier, and that's all I've seen. I'm waiting to catch a deal on this and the Wonder Woman 2-disc, even though I haven't liked Simone's run.